Only bonds were lower this week; other asset classes were mixed. Still, the biggest moves were all to the downside, as coffee fell 3.4%, gold stocks dropped 2.1%, and long term bonds declined 1.5%. Copper had the largest gains, rising 1.3%. The only rising national currency was the Euro, up 0.4%. The Japanese Yen fell the most, off 0.6%. The USD was down 0.5%, as were its short term bonds. Long term TLT dropped 1.5%. The cryptocurrencies retained most of, or even built on, the previous week's gains. The larger cryptos were split, as Bitcoin rose 0.6% and Ethereum fell 0.9%. Some of the smaller cryptos saw larger declines; for instance DASH dropped 10.3%, but seen in the context of the prior week's 36.1% gain, this was a pullback, not a collapse. Equities were mixed. The Euro STOXX50 gained the most, rising 0.4%. Gold stocks had the largest losses, dropping 1.2%. The Dow Industrials fell 0.5%, while the S&P 500 added 0.1%. The largest price swings were in commodities. Copper, the week's biggest winner, added 1.3%, while coffee, the week's largest loser, fell 3.4%. Silver dropped 1.3%, and crude oil gained 0.8%. Cryptos and stocks moved higher, while currencies, bonds and commodities were mixed. The largest gains were in Bitcoin, which soared 23.6%, and Ethereum, which rose 16.8%. Palladium fell a further 2.2% to close at 32.6 grams/oz, the largest loss of the week for the second week in a row. The Japanese Yen was the only falling national currency, down 0.4%, and the Chinese Yuan was unchanged. The USD and Euro each rose 0.5%. Bonds performed worse than cash, as short term bonds rose 0.4%, and long term bonds fell 1.2%, the second largest drop for the week. Cryptocurrencies moved strongly higher, with the bulk of the rise occurring on Tuesday the 2nd, when a 100 million dollar order was placed for Bitcoin across multiple exchanges. The effects were felt across the crypto space. Bitcoin rose 23.6% for the week, Ethereum added 16.8%, and DASH gained 36.1%. Prices have continued to rise gradually since. The Euro STOXX led the equities, gaining 3.4%. Gold stocks lagged, adding 1.3%. The US S&P 500 rose 2.6%. Platinum and crude oil were the strongest commodities, gaining 6.8% and 5.5% respectively. Palladium dropped 2.2%, and copper slid 0.9%. Silver closed up 1.2%. Commodities and equities were mixed, but all other asset categories were higher. The largest gains were in Ethereum, which soared 5.2%, but copper also rose strongly, adding 4.7%. Palladium plunged 9.5% to close at 33.4 grams/oz, just above parity with gold, the largest loss for the week. The Canadian Dollar was the strongest national currency, gaining 1.6%. The Japanese Yen lagged the others, adding just 0.4%. Though not in the table below, the British Pound under-performed even the Yen, falling 0.2%, presumably on BREXIT concerns. The USD and CNY each rose 1.2%. Bonds did better than cash, as the short term SHY gained 1.3% and the long term TLT added 2.5%. Ethereum sagged early in the week, then rallied strongly on Wednesday and again on Friday to finish the week up 5.2%. Bitcoin followed a similar pattern, ending up 3.1%. Some smaller cryptos did even better than ETH. For instance, DASH ended the week up 8.4%. US stocks, and the Dow Industrials particularly, led equities higher. The DOW gained 2.9% while the S&P 500 added 2.4%. The Japanese Nikkei fell 1.6%. In the middle were the Euro STOXX, up 2.3%, and the UK FTSE, up 0.8%. Gold stocks closed lower, off 0.6%. Precious metals were weak, with palladium suffering a massive 9.5% drop and silver falling 1.1%. Platinum managed an anemic 0.9% gain. The real winners were copper, which rose 4.7%, and crude oil, which added 3.1%. Cotton also did well, rising 2.6%. All asset categories were mixed this week. The largest gains were in platinum, which rose 2.0%, but long term bonds and Japanese stocks also outperformed, rising 1.9% each. Coffee continued to fall, giving up 4.6% for the week's biggest loss. The Euro STOXX 50 was also hit hard, dropping 3.2%. The Japanese Yen was the only rising national currency, gaining 1.0%. The Canadian Dollar and Euro were the weakest, falling 1.1% and 1.0% respectively. The US Dollar fell 0.6%, while short term bonds gave up 0.3% and long term bonds gained 1.9%, an outstanding performance for a so called "risk free" asset. Bitcoin rose early in the week, hitting a high of 97.5 grams on Wednesday the 20th, then pulling back to finish the week at 95.4 grams, up 1.0%. Ethereum followed a similar pattern, but fell more sharply on Thursday, ending the week off 1.0%. The Japanese Nikkei index gained 1.9%, the only major stock index to rise this week. Gold stocks also rose, adding 1.6%. The Euro STOXX showed the largest losses, falling 3.2%. US stocks also pulled back, as the Dow Industrials fell 1.9%. Though not covered in this table, the UK FTSE index fell 1.3%, outperforming both its US and EU counterparts despite the controversy over the impending UK exit from the EU. Coffee prices plunged 4.6%, the largest losses of any asset class covered here. Copper also took a drubbing, falling 2.9%. The largest gains were in platinum, which rose 2.0%. Palladium pulled back 0.7% and silver was little changed, closing up 0.1%. Cryptocurrencies and bonds were higher while other asset categories were mixed. The largest gains were in gold stocks, which advanced 4.5%, and long term bonds, which rose 3.9%. Platinum fell 4.1%, the week's biggest loss. The Japanese Yen was the best performing national currency, rising 1.9%. The Canadian Dollar and the Euro fell 0.3% and 0.2% respectively. The US Dollar rose 1.2%, while short term bonds gained 1.6% and long term bonds zoomed higher, adding 3.9%, the second best performance among all asset classes. Bitcoin waffled about early in the week, but shot up on Tuesday and continued to rise, hitting a high of 94.7 grams on Thursday before settling back to close the week at 93.6 grams, up 2.3%. Ethereum lost ground early, gained it back on Tuesday, and finished the week up 0.2%. All the major stock indexes were lower, led by the Dow Jones Industrials which closed down 1.1%. The only rising stocks were gold stocks, as the HUI gained 4.5%, the largest advance of any asset class. In the commodities, the biggest moves were in crude oil, rising 2.7%, and platinum, falling 4.1% and giving back most of the prior week's gains. Palladium and silver each fell 1.7%. National currencies and major stock markets were higher, cryptocurrencies lower, and bonds and commodities were mixed. The largest gains were in the PGMs, as palladium rose 6.2% and platinum gained 5.3%. The worst losses were in Ethereum, which gave back some of last week's massive gains, closing down 7.3%, and gold stocks, which fell 4.4%. The Euro was the strongest national currency, gaining 1.7%. The Japanese Yen was weakest, adding 0.3%. US Dollar cash, more accurately described as notes of zero maturity, rose 1.3%. 1-3 year treasury notes rose 1.0%, and long term bonds fell 1.1%. Cryptocurrencies pulled back this week, giving up some of the prior week's huge gains. Ethereum fell 7.3%, while Bitcoin dropped 2.4%. Although gold stocks fell 4.4% this week, all the major stock indexes were higher, led by the Euro STOXX 50 which gained 3.1%. The Nikkei rose the least, up 1.1%. The S&P 500 advanced 1.7%. Commodities were mostly higher, with crude oil (off 1.3%) and silver (down 0.7%) being the exceptions. The platinum group metals stole the show, as palladium gained 6.2% and platinum added 5.3%, the largest gains of any assets covered here. Cotton also did well, rising 2.5%. National currencies and bonds were lower, stocks were mixed, and cryptocurrencies and commodities were higher. In some cases, much higher! Ethereum surged 21% to close at 3.5 grams, and copper rose 4.4%. The largest losses were in the 20+ year treasury bonds, which fell 1.3%. The worst performing national currency was the Japanese Yen, which fell 1.1%. The Canadian Dollar dropped the least, closing down 0.2%. USD cash was off 0.9%, while its short term bonds did a little better, giving up 0.8%, and its long term bonds did much worse, falling 1.3%. Ethereum worked its way higher from 2.9 grams to 3.5 grams, closing up 21.0%. Bitcoin also moved higher throughout the week, with much of its move on Monday; it ended up 9.6%. Some alt-coins, like DASH, hit their highs mid week, but still managed sizable gains (8.6% in the case of DASH). Gold stocks dominated the equity asset category, rising 2.9%. The major indexes were split geographically, with US indexes down while Japan and Europe rose. The Dow Industrials fell 0.4%, while the Nikkei index was up 1.4%. Commodities were all higher, led by copper (up 4.4%) and platinum (up 4.3%). Silver was the weakest, rising just 0.3%. Cotton was another strong performer, gaining 3.0%. 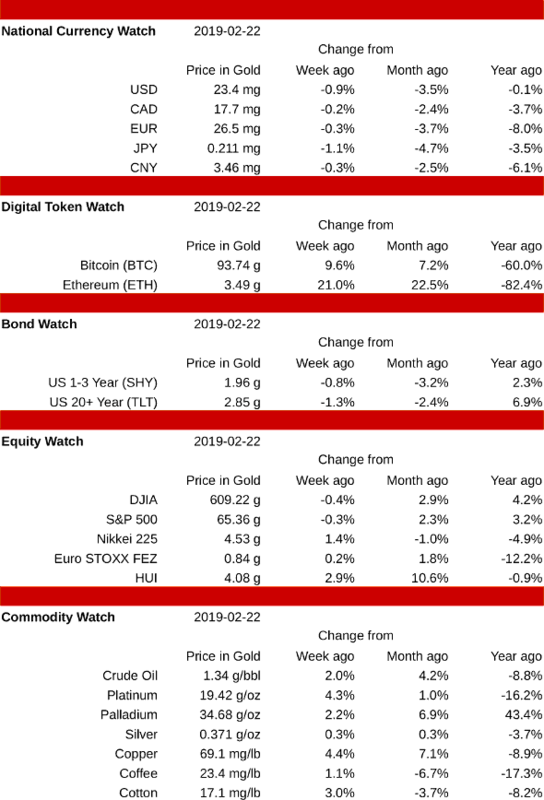 Looking back over the last year, the largest losses have been in the cryptocurrencies, as Ethereum and Bitcoin have fallen 82.4% and 60% respectively. Palladium was far and away the largest winner, rising 43.4%; but it was the only commodity in the black (coffee and platinum had the largest losses, 17.3% and 16.2% respectively). The second best returns came from TLT, the long term bond fund, which gained 6.9%. Holding USD cash just about broke even, losing 0.1% for the year. All other major national currencies were worse, with the Euro, down 8.0%, the worst of the lot. Even the British Pound Sterling (not shown in the chart below) did better than the Euro, falling 6.5% in the last year. National currencies and bonds were lower, major stock indexes were higher, and cryptos were mixed… but the big price moves were in commodities. Crude oil soared 5.7% while coffee and cotton fell 4.3% and 3.3% respectively. Platinum dropped to another new all-time low, while palladium gained 3.0% to reach a new 15-year high. As mentioned above, all currencies fell this week, led by the Japanese Yen, which closed down 0.9% and the Euro, which dropped 0.7%. The USD fell least, giving up just 0.1%, while the Chinese Yuan declined 0.2%. Bonds did worse than USD cash, as the short term SHY was off 0.2% and the long term TLT fell 0.4%. Bitcoin rose early in the week, then gradually declined to close down 1.4%. Ethereum followed a similar pattern, rising to 2.95 grams on Sunday, then declining slowly to finish the week at 2.89 grams, up 2.2%. Gold stocks were the only equities to finish lower, as the HUI closed down 0.7%. The Dow Industrials rose 3.0%, and the Euro STOXX50 ended up 2.5%. The Nikkei had the smallest gains for a major index, rising 1.9%. Crude oil powered higher each day, rising 5.7% for the week. Palladium also made major gains, closing up 3.0%, a new 15-year high. The largest losses were in coffee, off 4.3%, and cotton, down 3.3%. Platinum also fell, giving up 1.5% and setting a new all-time low of 18.55 grams on Thursday. Cryptocurrency prices turned sharply higher at the end of the week, leaving Ethereum up 11.2% and Bitcoin up 5.4%. Bonds were also higher, but other asset classes were mixed. Crude oil and platinum saw the largest losses, as crude fell 4.3% and platinum dropped to a new all-time low of 18.9 grams, down 2.9%. The USD was the strongest national currency, rising 0.3%. The Canadian Dollar and the Euro were weakest, falling 1.0% and 0.9% respectively. The Yen and Yuan were unchanged (Chinese markets were closed all week for Lunar New Year, but were virtually unchanged when reopening on Monday the 11th). Bonds were higher, with the short term SHY rising 0.6% and the long term TLT gaining 1.7%. Cryptos settled slowly through most of the week, then jetted higher on Friday, in part due to positive comments from the SEC on the eventual likelihood of a Bitcoin ETF. This left Bitcoin up 5.4% and Ethereum up 11.2%, making them the best performing assets for the week. Japanese and European stocks fell 2.2% and 1.4% respectively. US stocks were the best performers, as the Dow gained 0.5% and the S&P added 0.3%. Gold stocks were up 0.1%. Crude oil plunged 4.3%, the largest drop of any asset class. Platinum also had a bad week, falling 2.9% to a new all-time low of 18.9 grams. Palladium had a very strong week, rising 2.2% leaving it in third place after the cryptos. Copper also did well, rising 1.7%. Silver was down 1.1%. Note that I am once again updating the Argentine and Chilean Pesos!